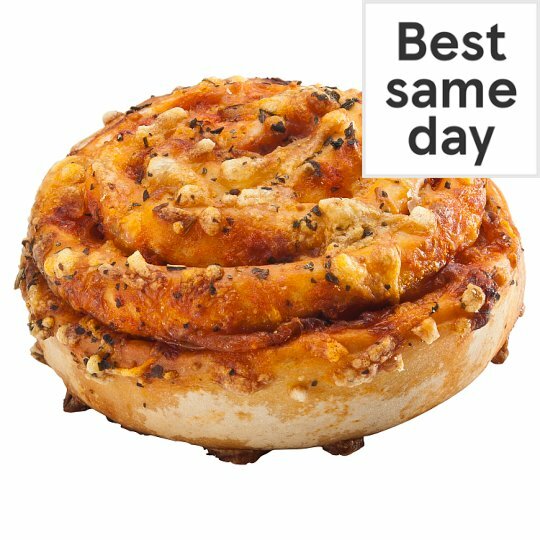 Soft bread swirl with tomato filling, topped with Gouda medium fat hard cheese and basil. INGREDIENTS: Wheat Flour, Water, Gouda Medium Fat Hard Cheese (Milk) (14%), Tomato (3%), Tomato Purée (2.5%), Onion, Sugar, Pasteurised Egg, Yeast, Rapeseed Oil, Dried Onion, Tapioca Starch, Salt, Dried Whole Milk, Rice Starch, Maize Starch, Basil, Sunflower Oil, Flavouring (Celery), Hydrolysed Maize Protein, Paprika Extract, Concentrated Lemon Juice, Garlic Powder, Black Pepper, Dried Garlic, Dried Egg White, Thickener (Xanthan Gum), Glucose Syrup. Contains milk, wheat, egg and celery. Our bakers prepare a variety of products in our bakeries, this product may also contain peanuts, nuts, sesame, egg, soya and other allergens For allergens, including cereals containing gluten, see ingredients in bold.